Getting it right in the esthetic zone! 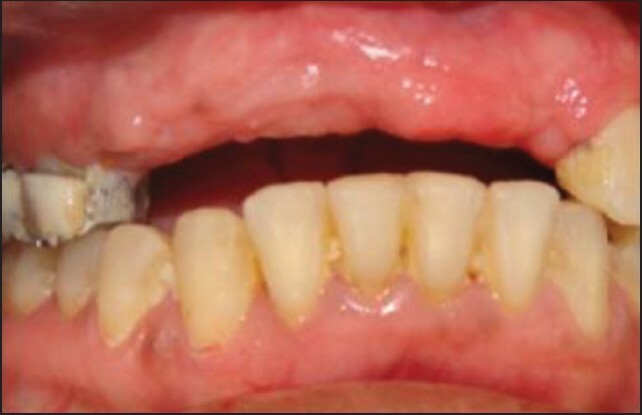 A 46-year-old female healthy patient with no systemic history, reported to the clinic in 2008 with a chief complaint of mobile upper anterior bridge. Anamnesis and detailed history revealed that she had lost her #21 due to trauma from accident in childhood. Subsequently, she had prosthetic replacement (thrice) in the form of a long span bridge since 1984. 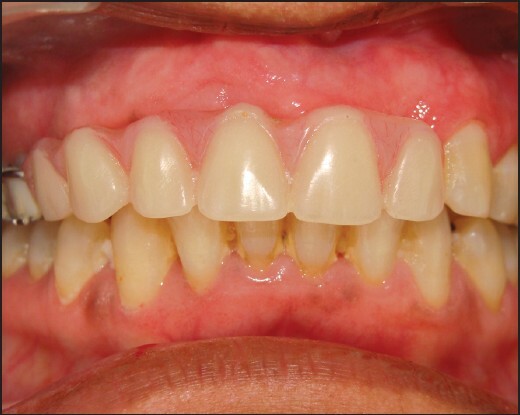 Intraoral examination revealed a long span bridge extending from #14, 13, 12, 11, 21, 22. The fixture was mobile [Figure a]. Patient also had a bridge from #17, 16, 15 and #25, 26, 27. The gingiva phenotype was thick and keratinized. The alveolar ridge in #21 area was very thin, with marked buccal bone concavity [Figure b]. 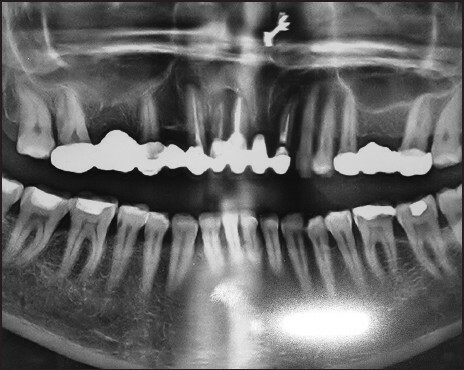 Preop orthopantomogram (OPG) revealed both the maxilla and mandible, the maxillary sinus, inferior alveolar canal (IAC) with good contrast and symmetry. Upper anterior teeth depicted failed endodontic treatment. 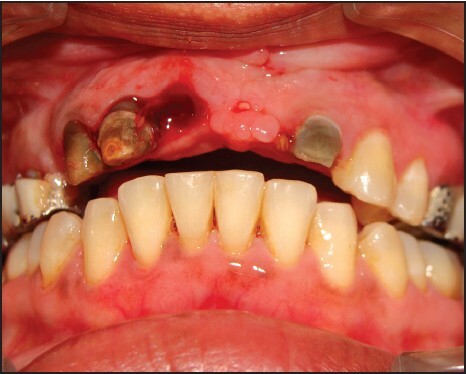 Periapical lesion and marked bone loss was noted in teeth number #13, 12, 11, 22 [Figure c] and [Figure d]. Denta scan findings revealed intact buccal and lingual cortical plates with buccal bone dehiscence in #22. In the region of #12, 11 buccal bone plate was missing at the crest, but was present at the middle and apical area. Pictorial representation of management of case [Figure e], [Figure f], [Figure g], [Figure h], [Figure i], [Figure j], [Figure k], [Figure l]. For an acceptable esthetic result, implant placement in the anterior zone demands thorough preoperative diagnosis and treatment planning combined with excellent clinical skills. 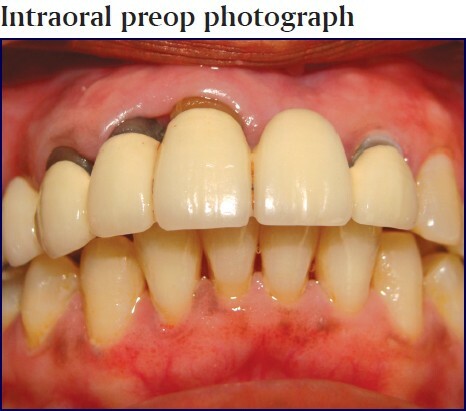 The above-discussed case, of a middle-aged lady, had a long span bridge because of loss of anterior teeth due to trauma. The bridge that served for more than 20 years was finally failing along with the teeth that served as abutments. Hence, implants were the only treatment option. Implants for #14 and #16 were planned as well, since the posterior bridge was failing as well. 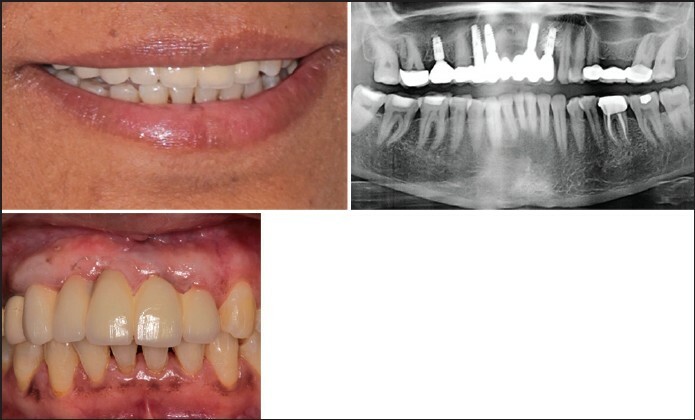 Along with all the above guidelines, the real challenge was loss of buccal bone contour especially in #22 region. Also in #11, 12 region, there was crestal bone loss. 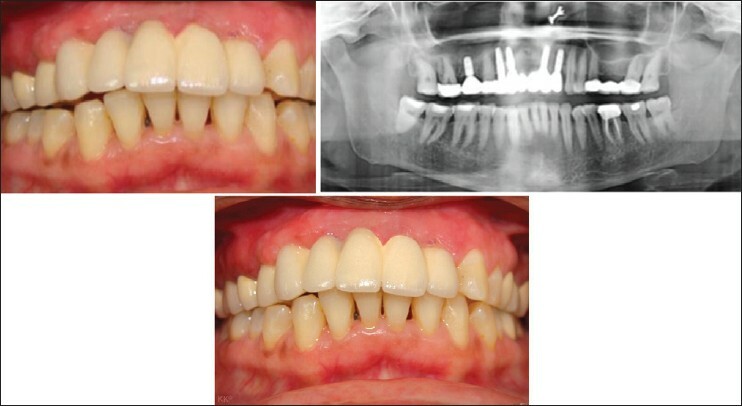 However, a thick gingiva phenotype helped to overcome the challenge posed by dehiscent buccal bone. A subepithelial connective tissue graft to augment soft tissue volume is done, whenever soft tissue is deficient. However, the present case did not warrant any soft tissue manipulation, since the soft tissue was very thick and adequate in volume. Timing of the implant placement is another important factor to meet the challenges in the anterior zone. In this particular case, no immediate implantation was planned so as to allow the soft tissue to close primarily. In the extraction sockets, resorbable collagen was placed which helped to maintain the volume. Because of allowing the ridge to heal naturally, the overall dimension of the edentulous span was optimal enough to place delayed implants after 4 months. No major bone manipulation techniques were needed, except for bone expansion in #22. The major challenge during surgery was to precisely position the implants according to the tooth assigned, so as to achieve good emergence. Because of subcrestal positioning and choice of the implant system (Ankylos) used, very stable crestal bone around the implants was noted in the follow-up panoramic radiographs (5 years follow-up) [Figure m]. Implants placed subcrestally do not have a polished collar, which allows the bone at the crest to grow over the head of the implant. Another important factor to note is the kind of connection between the implant and the abutment. A conical (Morse taper) connection always creates a bacteria proof seal that helps to minimize crestal bone loss after loading of implants. It is always desirable to have such a bacteria proof connection in the anterior zone for the long-term stability of the crestal bone and the soft tissue associated with it. Follow-up clinical picture in the case mentioned here depicted very stable soft tissue. The ridge dimension also appeared fuller, than what it was before the implant therapy (visible in the 5 years follow-up clinical photograph). To meet the challenges in the esthetic zone; proper planning, precise placement of implants, deft and delicate handling of soft tissue is mandatory. Timing of placement, subcrestal positioning, and choice of implant system are also important to get it right in the esthetic zone. In the case described here, following strict protocols helped to overcome the challenges of esthetic zone. No major grafting procedures were needed. The timing of placement (delayed), choice of implant system (Ankylos), positioning of implants (subcrestal and in the appropriate tooth position) in the surgery, and deft and diligent handling of the soft tissue helped to achieve optimum esthetic result. 1. Al-Sabbagh M. Implants in the esthetic zone. Dent Clin North Am 2006;50:391-407. 2. Saadoun AP, Le Gall MG. Periodontal implications in implant treatment planning for aesthetic results. Pract Periodontics Aesthet Dent 1998;10:655-64. 3. 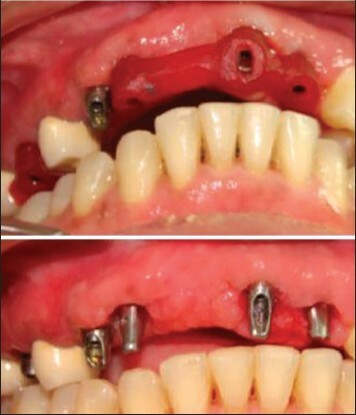 Jansen CE, Weisgold A. Presurgical treatment planning for the anterior single-tooth implants restoration. Compend Contin Educ Dent 1995;16:746, 748-52, 754. 4. Kois JC. Predictable single tooth peri-implant esthetics: Five diagnostic keys. Compend Contin Educ Dent 2001;22:199-206. 5. 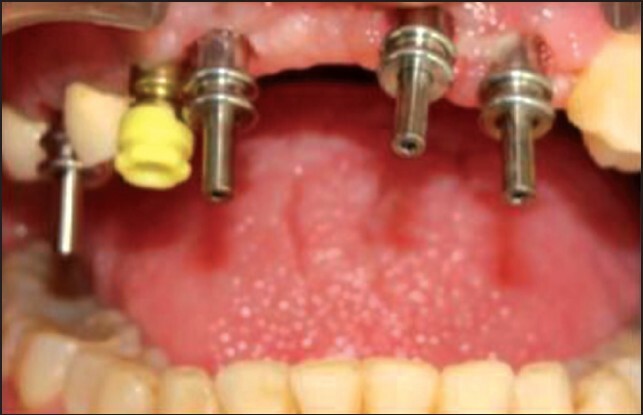 Anson D. Maxillary anterior esthetic extractions with delayed single-stage implant placement. Compend Contin Educ Dent 2002;23:829-30, 833-826, 838. 6. Tischler M. Dental implants in the esthetic zone. Considerations for form and function. N Y State Dent J 2004;70:22-6. 7. Sclar AG. The Bio-Col Technique. In: Sclar AG, editor. Soft tissue and esthetic considerations in implant dentistry. Chicago: Quintessence Publishing Co., Inc.; 2003. p. 75-112. 8. 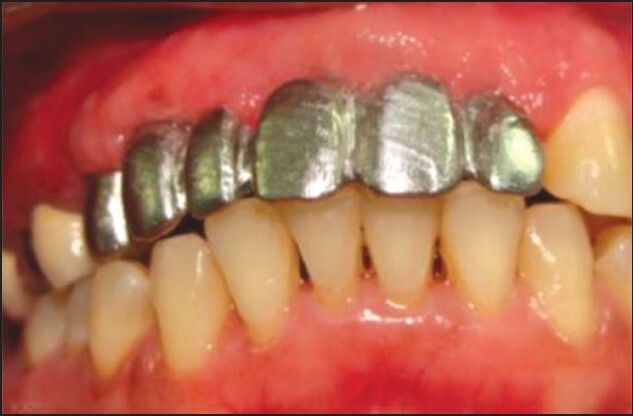 Hermann JS, Cochran DL, Nummikoski PV, Buser D. Crestal bone changes around titanium implants. A radiographic evaluation of unloaded non-submerged and submerged implants in the canine mandible. J Periodontol 1997;68: 1117-30. 9. Davarpanah M, Martinez H, Celletti R, Tecucianu JF. 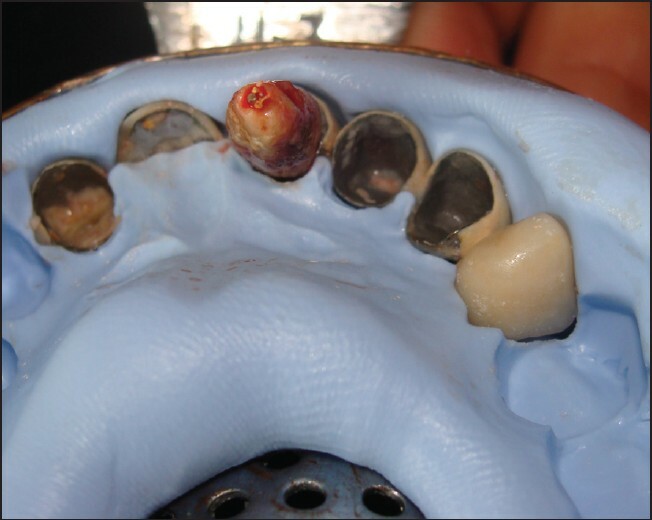 Three-stage approach to aesthetic implant restoration: Emergence profile concept. Pract Proced Aesthet Dent 2001;13:761-7. 10. Belser UC, Bernard JP, Buser D. Implant-supported restorations in the anterior region: Prosthetic considerations. Pract Periodontics Aesthet Dent 1996;8:875-83. 11. Belser UC, Schmid B, Higginbottom F, Buser D. Outcome analysis of implant restorations located in the anterior maxilla: A review of the recent literature. 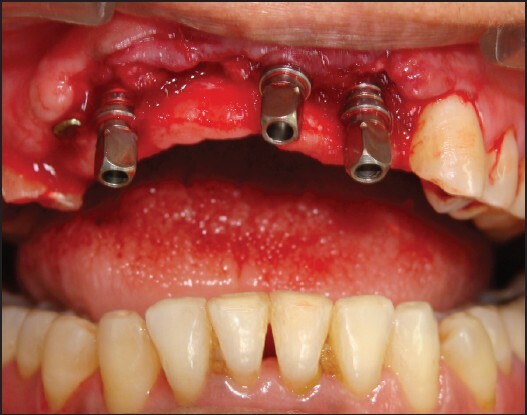 Int J Oral Maxillofac Implants 2004;19:30-42.